LabStorm: Do you have an opinion on something you know nothing about? DC happy hours. For every policy wonk, there are easily three people who voice strong opinions on things they know almost nothing about. This isn’t just DC– this is the world over. Phantom opinions are part human nature. Complex choices require complex thinking. Public opinion polls (or DC happy hours) often don’t provide people with the opportunity for thoughtful deliberation. As a consequence, we’re not really polling opinions. Even if we provide information, we’re usually just polling people’s responses to heuristics and sound bites. So how do we understand what people really think? As Feedback Labs thinks about collecting feedback about what regular people want, how do we know what people really want? Deliberative polling helps people think through issues to help them decide what will make their lives better. It doesn’t just ask what they think right now; it gives them both the information and conversations to help them think things through. To learn more, Feedback Labs’ LabStorm hosted Jen Richmond from the Center for Global Development (CGD) to discuss her current use of deliberative polling in Tanzania. Several years ago, large natural gas reserves were discovered offshore, providing the country with windfall revenue and an opportunity to transform the economy. Richmond and her team are using deliberative polling to understand how regular citizens from all over the country think the natural gas reserves– and profits– should be used. A representative sample of people from all over the country came to Dar es Salaam to participate in a two-day facilitated discussion with other citizens and experts. Balanced information was provided along with neutral moderators to help facilitate discussion. At the end of the session, participants were re-polled and significant opinion changes were found. As the CGD continues to analyze data, Feedback Labs is keen to understand how deliberative polling influences policy-makers and voters. Will the government use the deliberative poll’s findings? Will participants in the deliberative sessions influence the opinions of other non-participants? 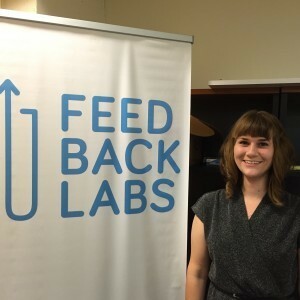 How, in effect, will the feedback loop be closed?